DISCOVER the niche that suits your passion and skills and what's uniquely marketable about your mission. UNDERSTAND why speaking is one of the most powerful marketing tools you have at your disposal. EXPLORE the top ways to make money by speaking. SECRETS to marketing your business that will give you credibility, visibility and immediate new clients­ even if you have never spoken before! STEPS for building a profitable speaking practice. 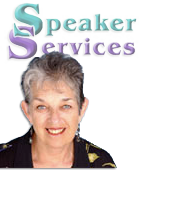 Susan Levin is the founder of Speaker Services. Since 1992 she has been bringing speakers, authors and experts together with audiences through her paid listing service SpeakerServices.com She is a Marketing Strategist for Speakers and Authors and is known as the "wise woman" of speaker marketing.